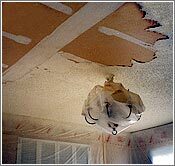 Whether you dislike the look or have dirt and stains on your popcorn ceiling, your best option is to remove the old texture and start from scratch. Sprayed acoustic ceilings are notorious as dirt and dust collectors. Patching water stains and cracks is almost impossible. After popcorn ceiling is removed, Solidarity Painting applies knockdown texture to the areas and repairs usually both ceilings and walls. Popcorn ceilings are very difficult to keep clean. Cobwebs and dust around vents can be removed by holding the wand of a vacuum about an inch from the surface of the ceiling. Any more forceful action, such as sweeping, can remove loose "popcorn" like texture. If an acoustic ceiling is discolored from age, however, there is really no way to clean it. It's not recommended to roll paint on an acoustic ceiling, as it is very porous. It will absorb a great deal of paint and it's nearly impossible to achieve even coverage. Often, the entire layer of "cottage cheese" texture comes right off on the roller, leaving a bare strip of drywall. The most efficient way to paint a textured ceiling is to spray it with a flat latex paint. It's a difficult job, best left to a professional like Solidarity. 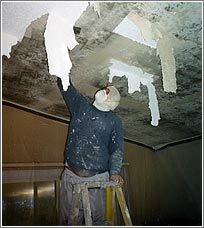 One possible complication is the fact that asbestos was widely used in textured ceiling spray prior to 1980. Solidarity will test for asbestos if your house was built before 1980.